Why should you care? Because pesticides have been linked to cancer, among other things. Because, pound for pound, your kids absorb way more of them than you do. And because if your family simply eats organic or avoids these 12 fruits and veggies altogether, you can reduce their overall pesticide exposure by 80 percent. Pound for pound, your kids absorb way more pesticides than you do. But avoiding these 12 foods can reduce their overall exposure by 80 percent. Especially when you’re a parent, it’s so important to know when these chemicals are in your food. But unless you’re exclusively shopping organic it’s hard to remember what’s on the list. We can download shopping guides till the cows come home, but I for one can never remember where I put them. So here are my two tricks for remembering the 12 fruits and veggies that I put back on the shelf unless I’m buying organic. 1.The ABCs: apples, bell peppers and celery. Fruit cup: peaches, nectarines, blueberries, grapes and strawberries. (Visualize those weird tin-can fruit cups you used to get in the school cafeteria.) Lettuce, cucumbers and potatoes. (Visualize the veggies typically served with the fruit cup.) And spinach, which your kids won’t eat anyway. 2. When in doubt, go for things you can peel by hand. 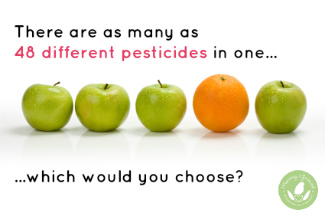 An orange over an apple, which can contain as many as 48 different pesticide residues. Corn before a potato—you get the picture. Then go organic for those you can’t. ← What (the %&*^) is Eco Friendly Fashion?